This was supposed to herald the start of a potentially profitable sequence of home games for Dundee United, but instead it turned out to be another one of those torturous Tannadice afternoons. 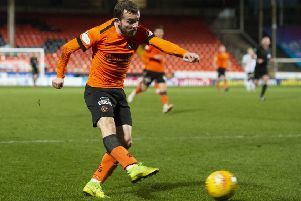 Csaba Laszlo’s side had within their sights a win in this fixture ahead of Queen of the South’s visit on Tuesday, before welcoming Dunfermline next weekend, only to fail to measure up yet again. They found themselves overwhelmingly outplayed by John Robertson’s visitors and things would have been yet more difficult to digest had it not been for Thomas Mikkelsen’s 64th-minute equaliser. Iain Vigurs’ 30th-minute header was the least the Highlanders merited for making a mockery of their lowly league position, and United were fortunate to remain in contention thereafter. “Missed chances came back to haunt us because we could have been 5-0 up at half-time,” said Robertson afterwards. Inverness had decent memories of their last visit to Tannadice back in October, savouring a 2-0 victory which in turn led to the dismissal of Ray McKinnon as United boss and the subsequent arrival of Laszlo. They certainly began with serious intent amid the freezing conditions. Vigurs, their talismanic midfielder, released George Oakley whose low effort was well held by Harry Lewis, the on-loan Southampton goalkeeper. That set the tone for a period of dominance which minutes later saw Oakley’s shot blocked by Mark Durnan after three United defenders had hesitated in dealing with an awkward ricochet inside the box. They got their rewards, however, on the half-hour mark. Liam Polworth’s driven corner was met by Vigurs who rose unchallenged to power a header high into the roof of Lewis’ net. There was no let-up from the visitors. Five minutes before the interval, Vigurs sent Oakley free down the right and his cross was within inches of being turned home by Connor Bell at the far post, only for Durnan to clear at the expense of a corner. Scott McDonald, United’s experienced Australian striker, was introduced after the break for Paul Quinn and midway through the half they did manage to drag themselves level. Billy King’s deep cross found Mikkelsen and the Dane did just enough to hook his finish back across Mark Ridgers and into the net. Substitute Paul McMullan forced Ridgers into a fine save from his late drive but for United it’s all about cementing a play-off spot. “We have to try and start Tuesday’s game the way we finished this one,” said Laszlo.